This book examines the distribution pathway of lettuce (Lactuca sativa) and cabbage (Brassica oleracea var. capitata) produced in Accra, Ghana from the primary stages of production to the final stages of distribution in the retail sector and to the final consumer. The book covers gaps in the existing marketing channels of lettuce and cabbage trade, proposes how the associated constraints could be solved to better protect the chain, and explores the application of the findings in other contexts. 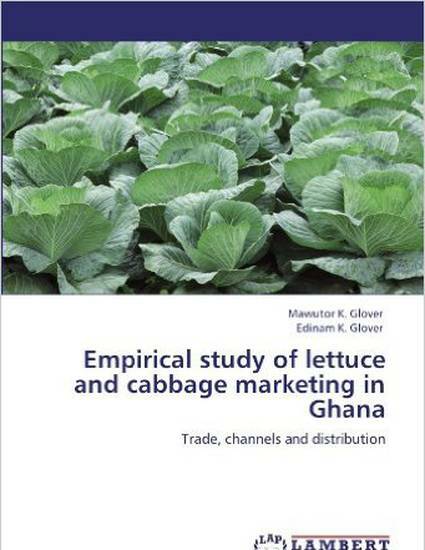 It presupposes a thorough understanding of the social, cultural, ecological and economic factors shaping lettuce and cabbage production in Ghana. The material included in this book is considered to be of immense value and interest to advisors as well as those concerned with lettuce and cabbage research, development including production and marketing as a whole.